Anatomy Laboratory Manager Fieke Neuman with the peritoneum in a box she has created. Ask a former fashion designer to help you create a teaching tool for an anatomy lecture and the results are beautiful, clever and original. That was what Associate Professor Christine Jasoni found when she approached Laboratory Manager Fieke Neuman for an idea to make a lecture on the brain memorable to students being taught alongside hundreds of others in the University’s large St David Lecture Theatre. Together they came up with the answer: a burlesque brain made of layers of different fabrics and metals that she could dress and undress to teach students about the brain’s anatomy. 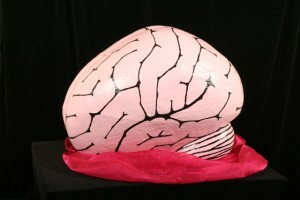 The burlesque brain with the “inner layer of meninges” unzipped. Associate Professor Jasoni says Ms Neuman is always enthusiastic about her proposals. Ms Neuman’s fashion accomplishments include winning the Menswear section of the Smokefree Fashion Design Awards in 1998 and travelling to Antarctica under an Antarctic Arts Fellowship in 2002. For the past few years she has turned her attention to creating these hands-on teaching aids made of fabric and textiles. As well as the burlesque brain, she has made string boards tracing spinal neural tracts, and a peritoneum in a box to help students understand the layers of the abdominal peritoneum. The designs are stunning and effective. Fabric of various colours, weights and textures mimic the structures and tissues of the body surprisingly well, for example pink organza to illustrate the delicate, innermost layer of the meninges of the brain and heavy, beige, suede-like fabric for the thick outer layer. “Because of their flexible nature, fabrics can actually be quite a good approximation of living anatomy, and simplified models that students can manipulate can help them understand three dimensional structures, such as the peritoneum, better,” Ms Neuman says. She is proud of her designs, but quietly modest about their creation. The string board axon tracts were her first design, and are based on classic 1970s string art. Students use their hands and coloured wool to trace and learn several axon tracts – from the brain all the way to the feet. Similarly, the peritoneum can be unzipped and manipulated to help students learn. The models can be used again and again and are a welcome addition to Anatomy’s teaching tools. So much so, that they are sharing them with the rest of the world, making them available via the Creative Commons Attribution-NonCommercial-ShareAlike licence. The licence means anyone can download the patterns for free, and use them non-commercially. For now she is very happy to be sharing her expertise. And those who she has helped are thrilled with the results. Patterns of the anatomy teaching models, and information sheets, are available from the Department of Anatomy website. Patterns are also searchable via DigitalNZ. This entry was posted in Artists, Craft, CTANZ people, Dunedin and tagged education, textiles. Bookmark the permalink.